This essential oil repairs damage cause by heat products, chemicals, and the sun. It strengthens proteins and helps hair grow stronger, quickly. Argan oil is non-greasy and helps prevent split ends while nourishing the hair. It’s filled with fatty acids and vitamin E to bring dull hair back to life. This oil has the largest amount of vitamin E and monosaturated fats. It moisturizes, strengthens, and replenishes, as well as promotes hair growth since it can be absorbed in the hair and scalp. Coconut oil protects hair, locks in moisture, and strengthens the hair shafts because it is rich in lauric acid, vitamin E, iron, and vitamin K. It also prevents hair loss and inhibits split ends. This oil is able to retain water, allowing the maximum amount of moisture into the hair, while keeping it in! It also battles frizz and brittleness which can occur from color treatments and styling tools. A stimulant for hair growth, rosemary oil thickens thin hair and helps heal the scalp when dry or itchy. It’s an ideal conditioner and it has even been said to darken hair, knocking out stray gray strands. Olive oil can be used on sensitive scalps and combats frizz and dryness quickly. It’s lightweight and filled with vitamin E and antioxidants so hair shafts are stimulated and strands are softened. This oil soothes dry and itchy scalps while improving dry and oily hair. It kills bacteria but also clarifies strands by unblocking clogged follicles, which allows for faster hair growth. This oil which is extracted from seeds of grapes is known for its detangling properties. It promotes hair growth and leaves strands soft and silky. 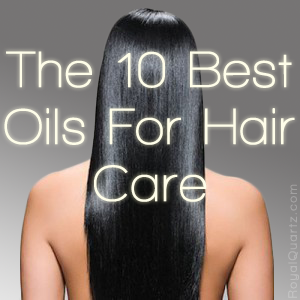 This oil contains a high amount of protein which makes hair stronger and shinier. It helps add body to lifeless locks and moisturizes and conditions without being overly heavy.